FREE SHIPPING ON ALL PADDLE BOARDS ORDERS TO YOUR HOME! The high volume of boards and accessories we ship annually has given us access to the lowest shipping rates in the business! We pass the savings on to you by absorbing the shipping costs and offering Free Shipping to your residential doorstep on all orders for boards and accessory items over $75. Orders less than $75 will be charged a $9.50 Flat Rate Shipping Charge. Applies to orders shipped within the continental USA only. ALASKA, HAWAII & PUERTO RICO DO NOT QUALIFY FOR FREE SHIPPING. We strive to get all orders out on the same or next business day from our Costa Mesa, CA Warehouse. 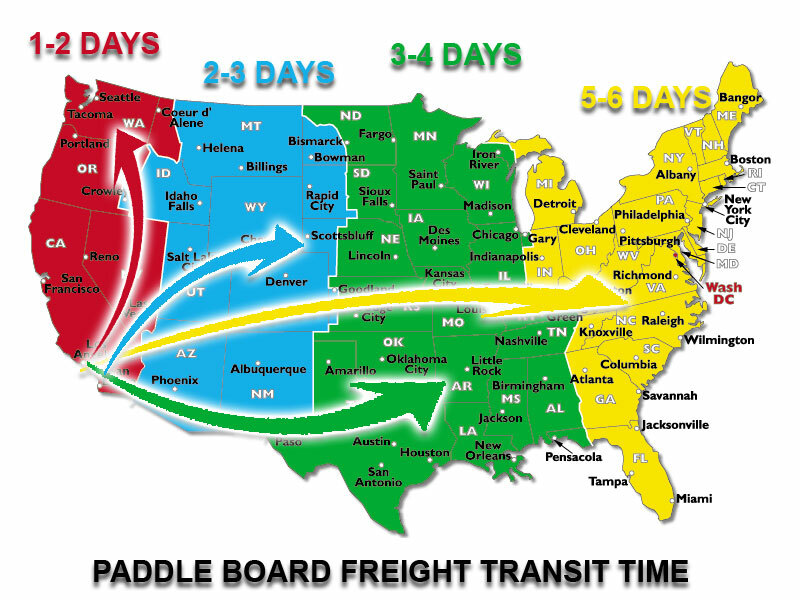 Paddle Surf Warehouse offers FREE SHIPPING on all stand up paddleboards shipped to either a commercial or residential address within the Continental USA. NO ADDITIONAL CHARGES APPLY FOR DOOR TO DOOR RESIDENTIAL DELIVERY. WE SIZE AND CUT ALL PADDLES ORDERED OR THAT COME WITH PACKAGES TO YOUR HEIGHT FOR FREE. WE DO NOT CHARGE FOR THE SERVICE. You must have an appointment for your board to deliver, and someone must be available to inspect and sign for the package during the delivery window. HAWAII Board Orders Only $199 - $249 Shipping Per Board. We do not offer international shipping outside the USA at this time. Before signing the delivery receipt, you must unpack and inspect the board thoroughly for any signs of damage that may have occurred during transit. All shipments are fully insured against damage PRIOR to you signing, however your signature constitutes your final acceptance of the merchandise "AS IS" from the freight company and releases them from any further responsibility. Absolutely no claims or returns can be made after final acceptance from the freight company so please be sure you are completely satisfied with your board prior to signing for it. If you have any questions or are not completely satisfied with the condition of your board upon arrival, call us immediately at 949.574.5897 and refuse the shipment. We will make sure to ship you a replacement board immediately at no additional charge to you. If the shipment is signed for without any notation of damage to the contents or box, and concealed damage is discovered after unpacking and inspecting the goods further, please email pictures of the damage to sales@paddlesurfwarehouse.com within 48 hours of signing for the shipment. We offer Free Domestic Ground Shipping on paddle and accessory orders over $75. Orders under $75 have a flat fee of just $9.95. This excludes INTERNATIONAL addresses. For AK, HI, PR and all other addresses outside the Continental USA, please contact us at sales@paddlesurfwarehouse.com PRIOR to placing your order for a shipping quote. We ship via UPS, USPS or FedEx. Once your order ships, you will be notified via email with your tracking number. Orders received before 2PM PST typically ship same day. Orders received after 2PM PST, on a weekend, or holiday will ship next business day. Most orders are delivered within 1-5 working days to any address within the Continental USA. Please open the package and inspect items for damage immediately upon arrival. If damage is found, please notify us immediately so we can get a replacement out to you and file the necessary claim with the shipping company. All damages must be reported to us within 3 days of you receiving your shipment. Our Best Price Policy. If you find a lower price - we will match it at your time of purchase. Stop by, email or give us a call. * Must be identical product competitor has in stock. * We must have it in stock. * We must be able to verify the competitors price. * Must be applied at time order is placed. * Does not apply to previous purchases. * We cannot honor misprinted ad prices of other retailers. 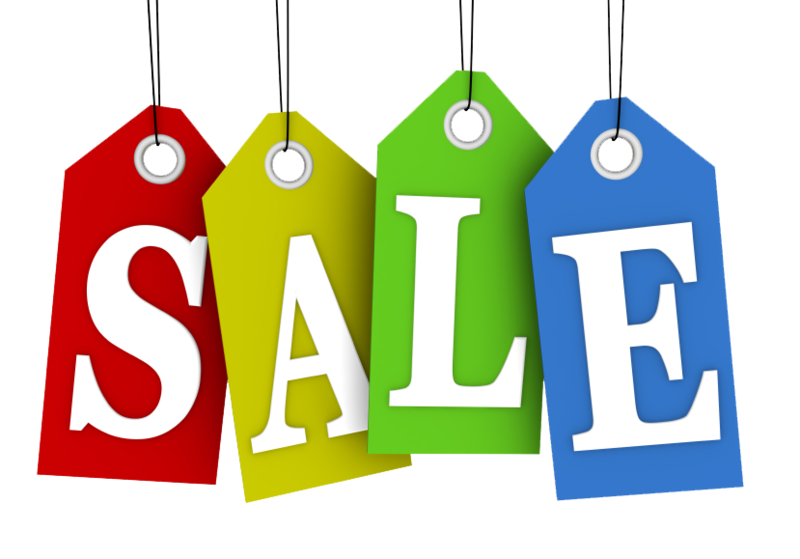 * This offer cannot be combined with any other existing offers or discounts.